For starters, this isn’t a production setup, this is just so that I can do some quick Hadoop demos on my Macbook Air (2011). In this case, my configuration is OSX Lion, 4GB RAM, and 256GB SSD. As well, a serious shout out to the authors below whom I had referenced to create this post. If you are not familiar with Homebrew, you are definitely missing the package manager for OSX (it’s their tag line, but it’s also very true). Homebrew will install packages into their own folders and use symlinks back to the /usr/local folder. This will allow for much easier removal and isolation of UNIX packages – such as Hadoop. As well, Homebrew will not require you to use sudo to perform a brew install. Install Homebrew by going to the Homebrew installation link and running the provided ruby script. In this case, please go to the link so that way if they change it, these instructions are more or less still up to date. • brew update – To ensure that the latest Formulas are available and installed in the /usr/local/Library/Formula folder. Formulas are Ruby scripts that define the installation of a package, you can find the list in the folder or online at Homebrew Library Formula; to make your own, check out the Formula Cookbook. i.e. its in fact a redirection error not a memory allocation error. To fix it immediately, you will need to update the Hadoop Formula locally which can be found in the /usr/local/Library/Formulas/hadoop.rb. Update the link so it points to the mirror site instead of this path. and the installation will proceed. • hadoop-env.sh: These are the Hadoop environment variables, a quick change is suggested to suppress an error message. And thanks to @arbovm for his details at: Flume and Hadoop on OS X. Suppress the “Unable to load realm info from SCDynamicStore” error. As noted in https://issues.apache.org/jira/browse/HADOOP-7489, for a single box deployment, update the text to include the line below. Below is a quick suggested configuration for the hdfs-site.xml file. In this case, the configuration is to set the Hadoop Distributed File System (HDFS) replication to 1 as this is a single box for demos and functional test. The below configuration is to set the Job tracker connection port. Please note that Hadoop will connect to localhost using ssh; to configure it so that way you can connect from-and-to localhost without needing a password, you will need public keys to your authorized keys. To do this ensure that “Remote Login” is enabled (System Preferences > Sharing; ensure “Remote Login” is checked). Denny this worked great ! On Mountain Lion with latest homebrew, there is no redirection error and so the first step in your directions to update the link to point to the mirror site doesn’t seem to be required. Otherwise it all worked just fine. Thanks a lot for the comprehensive directions. Great stuff! 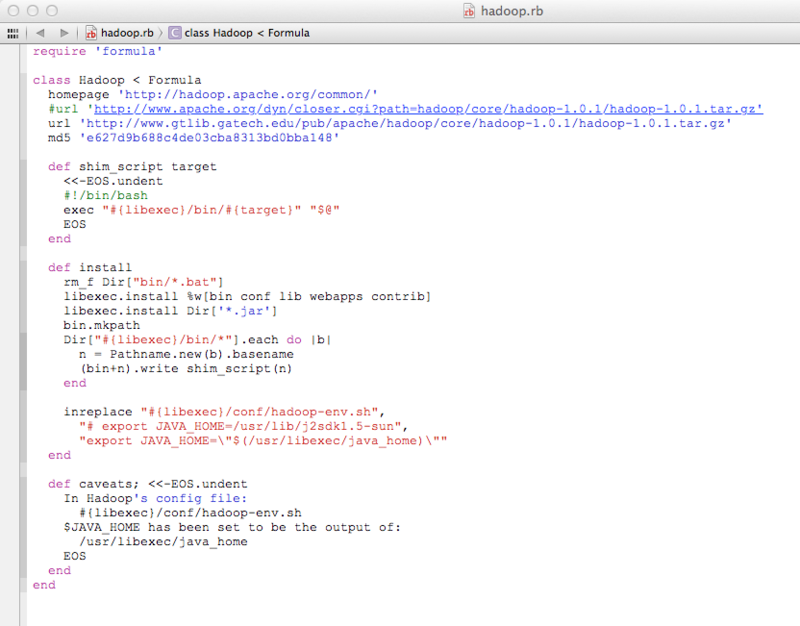 Got Hadoop up and running in 20 minutes thanks to this post! Thanks for that. Thanks! Glad to hear it was helpful! Really decent directions – thank you very much. Please guide me to solve these..
Its a little tricky to debug this based on the above errors. When you get the “unable to load realm info from SCDynamicStore” error, are you getting this during startup, loading, reading? Yes I’m getting this only during these three times..I.e. startup, loading and reading files. What should I do? [Fatal Error] core-site.xml:1:15: The value following “version” in the XML declaration must be a quoted string. 13/01/22 00:13:36 FATAL conf.Configuration: error parsing conf file: org.xml.sax.SAXParseException: The value following “version” in the XML declaration must be a quoted string. 13/01/22 00:13:36 ERROR namenode.NameNode: java.lang.RuntimeException: org.xml.sax.SAXParseException: The value following “version” in the XML declaration must be a quoted string. This is a very helpful post, Denny. I kept coming back to it in Autumn 2012 and again this weekend. I installed Hadoop 1.0.4 on OS X 10.6.8 in autumn 2012. Above instructions were very helpful. If using Homebrew, as Denny says, you’ll want to make sure Brew itself, Xcode, and the command line tools are installed and current. Only after you’ve cleaned up with brew doctor, attempt to install Hadoop. * I didn’t run into any problems that I felt were related to the version of OS X, the version of Hadoop, or the version of Java. 10.8, Hadoop 1.0.4, and java version 1.6.0_37 seem to work ok together. * A big problem for me was that I found that I had multiple copies of Hadoop resource files on my box. Ugh. It’s from Autumn when I didn’t know what I was doing. I floundered for a while and then decided to focus on just one set of resource files. I focused on the install that I brought down from Apache in autumn. * If you end up like me with a mess and don’t know what *.sh and *.xml you’re executing, create a variable. I created a HADOOP_HOME=/Applications/hadoop-1.0.4/ in my ~/.bash_profile. I used $HADOOP_HOME/bin/*.sh to completely take the guess work out of what shell I was running. This is not a good practice. I need to clean up my filesystem. 2013-02-10 11:55:50,535 FATAL org.apache.hadoop.mapred.JobTracker: java.net.BindException: Problem binding to localhost/127.0.0.1:8021 : Address already in use. I restarted. This didn’t fix it. I changed mapred.job.tracker to use 9001, and fs.default.name to use 9000. This worked, but I admit I’m not sure if there is any causality. * A helpful command if just getting Hadoop up and testing with start-all.sh is jps. Use it right after executing start-all.sh to see what processes are running, or not! There should be five Hadoop, named processes (don’t include jps). Save time…go straight to the log file associated with the process that is missing. The command ps ax | grep hadoop | wc -l should return 6. Glad it worked and thanks for the additional info, eh?! Thanks for the post. Just installed 1.1.1 fresh and aside from the versions in the pathnames, the instructions are fine. Port 50030: isn’t operating. Haven’t looked into this yet. BTW, my install is a single-node on Lion Server 10.7.5; Xcode Version 4.6 (4H127). Got it. Don’t forget 1.1.1 has a dependency on the Snappy codec so you’ll have to compile the Hadoop-snappy code for it to work, eh?! Excellent – glad to hear it! This looks bad eh ? Sorry for the delay! The reason you’re getting this is due to the single quotes being translated incorrectly on the web page. If you could change them to proper single quotes / double quotes you should be good to go. HTH! Denny, many thanks! You posted this a while back, but it’s still very helpful indeed. I just installed Hadoop on Mac OS X 10.8.4 and it went like a charm. – On the Apple Developer website, the latest version of Java Developer is for Mac OS X 10.7. So, I searched for like another 15 minutes, but I couldn’t find anything newer. Also, if you try to install it, it will say that the certificate is outdated. I installed it all the same, and Hadoop seems to run fine, so no problems. – Denny, the quotes on your web page are translated into UTF-8 encoded double quotes. So that looks nice, but if I copy-paste this into the Hadoop XML files, or on the command line, that causes errors. Thanks for the great comments – I’ll update the page accordingly. Thanks! Thanks for the article. Finally i was able to deploy the hadoop on mac. I have tried like 5 times before everytime it use to fail to start. brew install hadoop was the easiest way to setup. Thanks for the article. I just installed on my Mac Maverick and it went all smooth like a cream. Only issue is that the http://localhost:50030/ & http://localhost:50060/ is not working. Any help?? 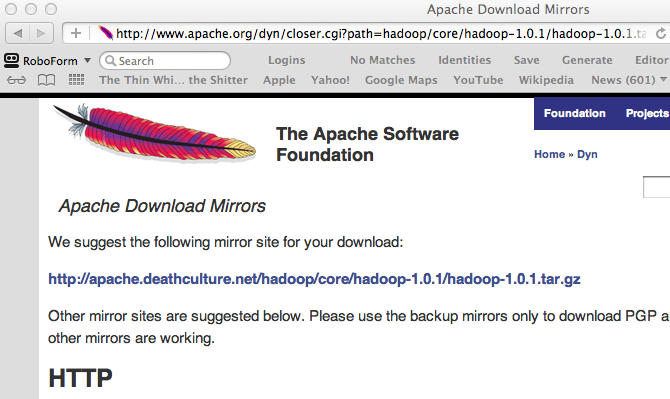 If you had done the installation recently using HomeBrew, perhaps you had installed Hadoop 2.5.0? If so, then you potentially have the YARN version of Hadoop meaning the Apps view is at http://localhost:8088 and HDFS is http://localhost:50070. HTH!